The story of how Amethyst came to be is as follows. Dionysus, the ancient Greek god of wine (or Bacchus to ancient Romans) was upset after being shunned by a passing mortal so he swore revenge on the next unfortunate soul to cross his path. The unlucky woman was Amethyst, and a big fan of the goddess Diana, followed by two hungry tigers courtesy of Dionysus. As Amethyst screamed, Dionysus filled his goblet ready for the main event, maiden versus tiger. Unimpressed by Dionysus's shenanigans, all-seeing Diana quickly turned Amethyst into a Quartz statue. While protected from harm, unfortunately the spell couldn't be reversed, causing a guilt-ridden Dionysus to weep tears of sorrow. Collapsing as his tears dripped into his goblet, its contents splashed onto the statue, creating the purple gem we call Amethyst. A variety of macrocrystalline (large crystal) Quartz (from the Saxon 'querklufterz', meaning cross-vein-ore) that occurs in transparent pastel roses to deep purples, Amethyst owes its colours to iron. Colour is Amethyst's most important consideration, with the deeper shades commanding higher prices. 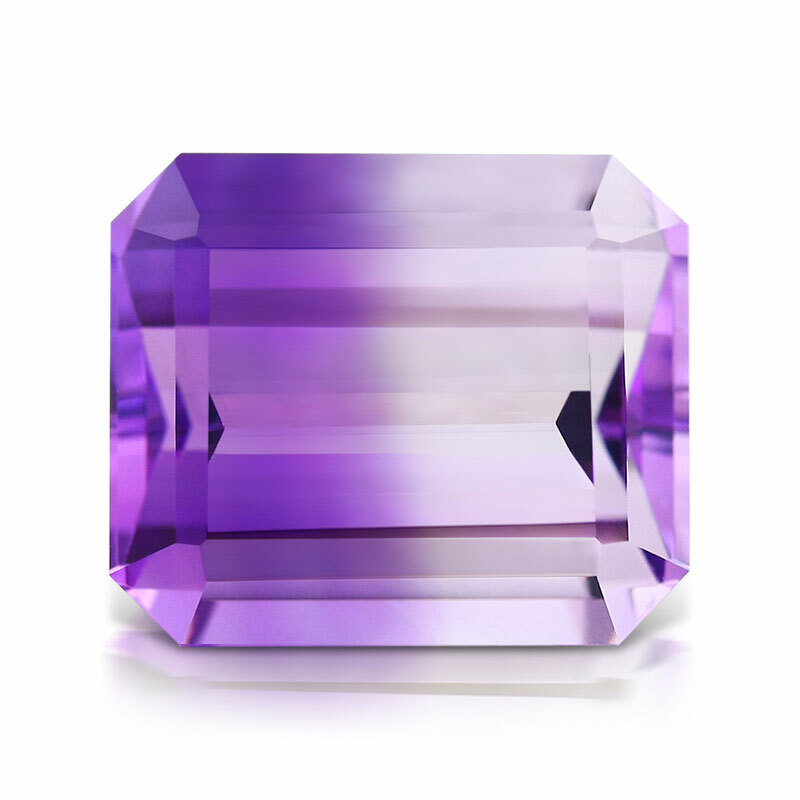 The most valuable Amethysts are medium to dark toned, transparent and pure violet with no shading toward red or blue, although blue or red flashes are desirable and highly coveted. Amethyst crystals occur with reasonably few inclusions, so the standard is eye-clean, with no visible inclusions when the gem is examined 15 cm from the naked eye. As it's a popular gem with gemstone cutters and jewellers, you'll find more different shapes and cuts of Amethyst than you will for many other gems. Found on every continent in varying amounts, Amethyst can vary depending on its origin. 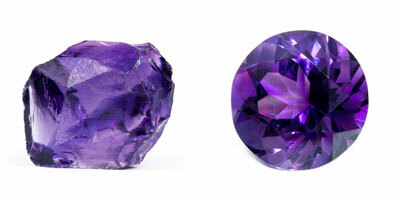 Brazil is currently the most well-known source, and the first Brazilian Amethysts arrived in Europe in 1727. 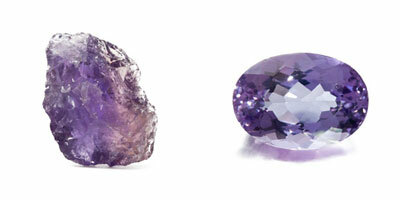 Uruguayan Amethyst is noted for its spectacular beauty. Deep purple Siberian Amethyst is no longer available, although 'Siberian' is often incorrectly used to describe any intensely coloured Amethyst. Caused by environmental changes during formation, Bi Colour Amethyst (also Amethyst Quartz) is a bicolour blend of Amethyst and White Quartz. 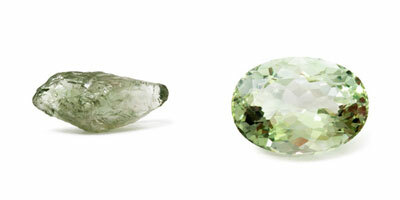 Faceted to showcase this feature, fine specimens have a balanced contrast between their colours. 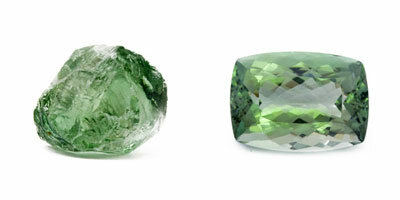 Ranging from pastel to deep forest green, Green Amethyst is the green variety of Quartz. 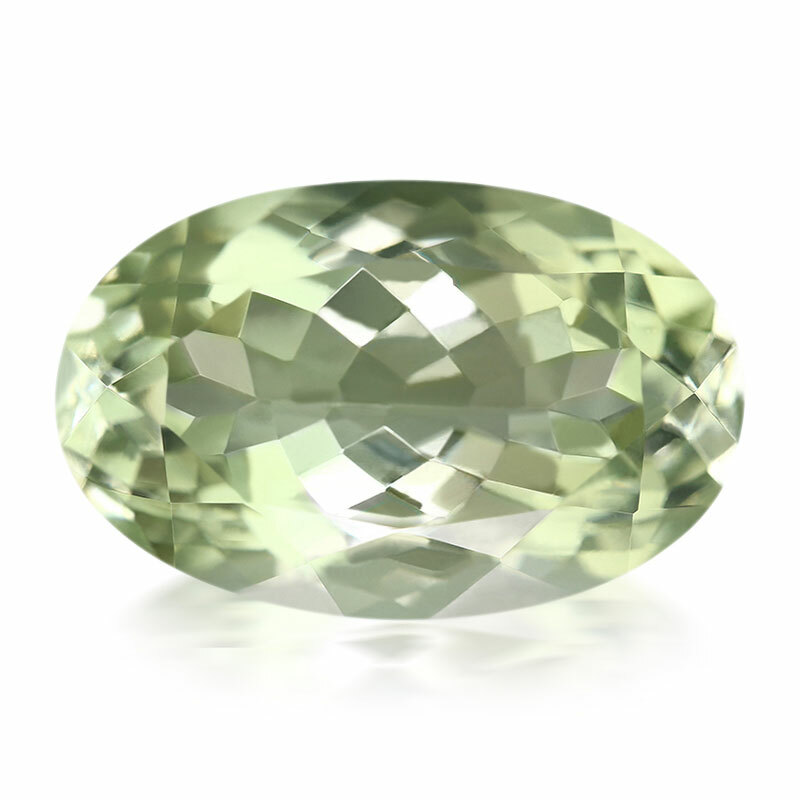 It is also known as Vermarine, Green Quartz, Lime Citrine or by its gemmological name, Prasiolite (from the Greek words 'prason', meaning leek, and 'lithos', meaning stone). 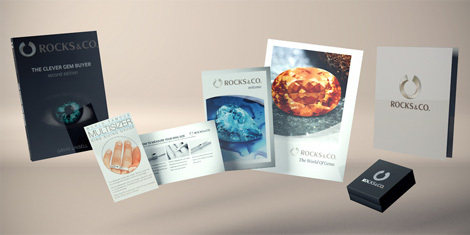 Olive Quartz is a related colour variety. 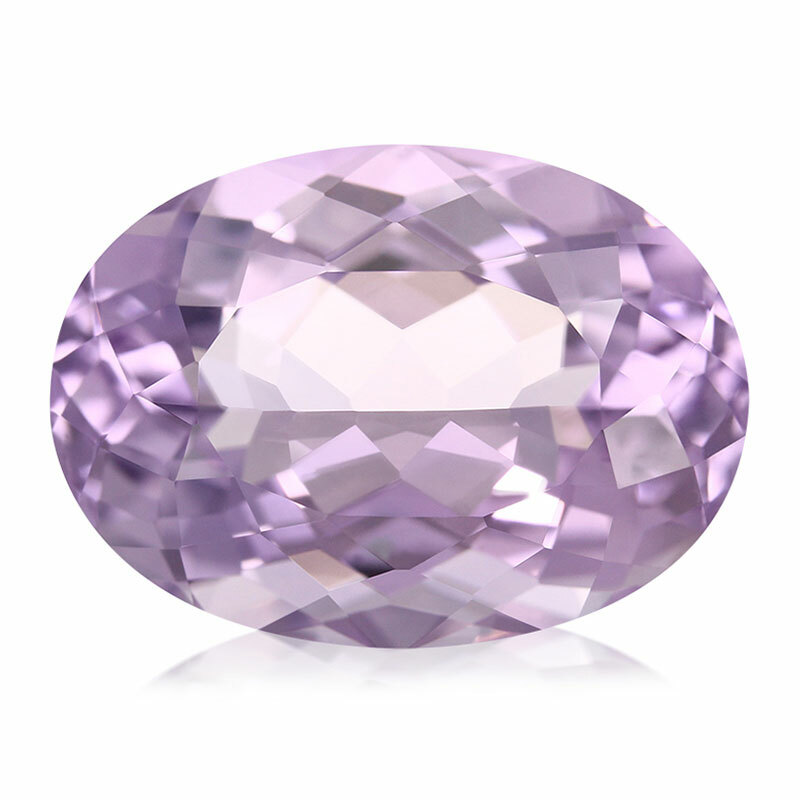 Hailing from Brazil, 'Rose de France' Amethyst (also Lavender Amethyst) is pastel lilac pink. A popular Victorian gem, it often features in antique jewellery.